Food texturizing agents have the ability to change the texture of any food, such as liquid food and solid food, without altering its properties. Food texturizing agents help in increasing the stability of the product by improving the suspension of other ingredients. Food texturizing agents are commonly used to add a creamy and flavorful texture to any sweet or savory dish without changing the original taste. Over the years, food texturizing agents have been widely used for patients who are suffering from swallowing difficulty or dysphagia. Various food manufacturers use food texturizing agents in various processed foods due to their various advantages. The primary function of a food texturizing agent is to alter the texture of the food product. But it also provides multiple benefits in food processing by improving the palatability and appeal of the food. Fast evolving lifestyles have led to many innovations, typically in the food and beverage sector. Ready-to-drink beverages serve as a classical example of this. The hectic pace of today’s modern lifestyle has badly affected the lives of people. People look for alternative food products, and at the same time, focus on the ingredient content of the product. Ready-to-drink tea and coffee that contain food texturizing agents have emerged as an instant and healthier option available to people, and are currently in great demand in the beverage industry. For instance, Flavor Creations, a Brisbane-based food and specialty drinks manufacturer, offers a wide range of ready-to-drink beverages prepared using food texturizing agents. The company mainly aims at improving the lives of dysphagia patients by providing great taste and high nutrient content products. Increasing obesity issues and cardiovascular diseases over the last few years have triggered the demand for low-fat content food. Food texturizing agents have the ability to replace calorie-dense fats and oils, thus allowing the formulation of more healthful foods. Improved formulations of food products have also utilized food texturizing agents as 'fat mimetic'. For instance, cellulose derivatives such as microcrystalline cellulose, a type of food texturizing agent, are used to prepare low-fat ice creams and dressings. Food texturizing agents possess the ability to remain stable during the processing of food, along with providing a longer shelf life to the food product. These reasons have increased their usage in the development of canned pet food for dogs and cats. Food texturizing agents not only change texture but also stabilize and help in the gelling of canned food products. According to a study, cassia gum, a type of food texturizing agent, is regarded as safe for usage in canned pet food, and has been listed in the Annex of the Council Directive of Europe. The growing concerns regarding dysphagia and gastro esophageal reflux disease have led to the addition of food texturizing agents for infants in neonatal intensive care units (NICUs). Food texturizing agents make the food heavier without causing an alteration in the original texture, along with stopping the rising back of the food in the esophagus. This has created a high potential opportunity for food texturizing manufacturers to come up with innovative food products to cater to the growing demand in the baby feed market. 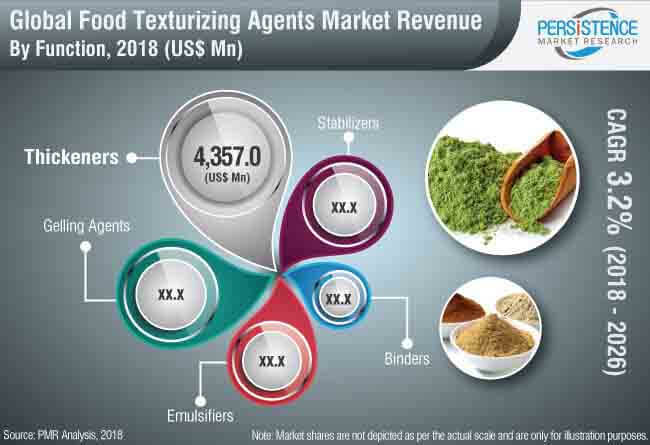 Food texturizing agents, apart from their texturizing nature, possess other essential functions such as emulsification, protein stabilization, gelling, and texture modification, which has surged their potential of adoption in the food and beverage industry. Food texturizing agents are widely used in soups, gravies, sauces, and toppings, whereas, for gelling properties, they are extensively used in marmalades, jellies, and jams. Acacia Gum - Reduces the surface tension of liquids. Also used as an emulsifying agent. Gelatin - Water-soluble. Widely used as a gelling agent. Pectin - Also used as a dietary fiber. Xanthum Gum - Prevents oil separation. Also increases the viscosity of a liquid. Difficulty in swallowing, or dysphagia, in medical terms, has witnessed a significant increase over the years, especially among the ageing population. Food texturizing agents such as thickeners help in slowing down the transit of fluids and food, providing more coordination time for the swallowing process. Thus, people suffering from dysphagia widely prefer food texturizing agents for varying the consistency of their food. For instance, Nestlé Health Science provides an innovative thickening agent specially designed for dysphagia patients, called Resource ThickenUp. This food texturizing agent rapidly thickens the food without affecting its taste or odor.